Christmastime is a season of remembering. Some days it can seem that we are caught up like Ebenezer in a visitation of the Spirit of Christmas Past. So it was for me this week, when I headed outside to clip magnolia branches for my Christmas decorations. I was rudely reminded that I no longer have a magnolia tree in my yard. This past February brought snows and ice storms, and one of the storms took out my prized magnolia. Only through the generosity of neighbors do I have any magnolia leaves this year. As I snipped a few leaves from a neighbor's tree, suddenly I was once again a new mom, very young and struggling to make ends meet. I lived with my husband and my darling six-month-old son in Michigan, 500 miles away from our families in Tennessee. We had just bought our first house, and I wanted it to look special for Christmas, but my budget was very limited. Naturally, I looked outdoors for greenery to bring inside. And there I stopped, as I realized that there were no big magnolia trees in Michigan. No beautiful waxy leaves to arrange just so atop a mantelpiece or in a windowsill. 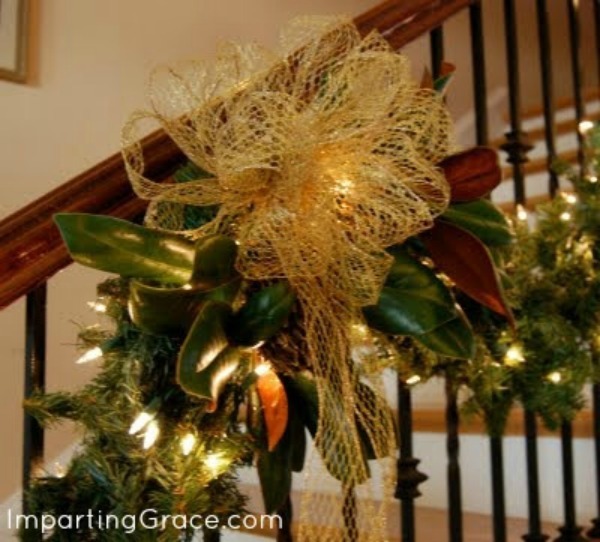 I had spent all my life in the South, and Christmas just didn't seem like Christmas without magnolia leaves decking the halls. Early one morning my mother called, as she often did, and I lamented the lack of magnolia leaves. "Hmmm," she said. "I never thought about the fact that magnolias don't grow in Michigan." "There are lots of magnolias here," I answered, "just not the evergreen kind. Not the grandiflora with the big beautiful leaves that I want." "Too bad you can't pop down here for a few minutes," Mama mused. "You know Nancy has four huge trees right in her front yard." Nancy was one of my mother’s best friends, and my mind’s eye pictured the four mature trees that stood just beside her front porch. "Wouldn't that be nice?" I sighed. Our conversation turned to other topics. Then I hung up the phone and made my way outdoors, where I gathered clippings of pine and fir and yew to fashion into wreaths and swags. My husband and I lit the Christmas tree and the fire and prepared to spend our first holiday season away from the South. A few days later, a UPS truck stopped in front of my house. The man in brown walked to the door, bearing a huge box and wearing a puzzled expression. As I signed for the package, he shook his head and said, "I can't imagine what could be in this box. It weighs almost nothing." Puzzled, I accepted the package from him. It was addressed to me, and it was from my mother. I eagerly tore it open to discover branch after branch of magnolia leaves. Each stem was carefully wrapped in damp paper towels and encased in plastic bags, as fresh as if they'd just been cut. With Nancy’s help, Mama had collected dozens of magnolia cuttings, then boxed them up and sent them to me. It's now been many years since my mother died. I am grateful that I moved back to the South before she left us. I was there when she passed from this life. Now that I'm safely back in the South, I can collect my own magnolia leaves. But every time I do, I can't help but remember the time that my mother understood how my soul needed a bit of home. And since I couldn't get it for myself, she had it delivered. Via God and UPS. What a great story! And what a wonderful memory of your mom. What a sweet story and a lovely way to remember your mom. There are no magnolia trees up here in NY, but lots of pine! Oh how I love sweet this story Richella and what a precious memory of your mom. I will always remember and cherish the time I received a box of pine cones my mom sent me years ago when I was living in Texas and missing one of the comforts of home. I remember that day, Richella. What a wonderful memory of your mom. What a beautiful story. That is a story you should submit somewhere...maybe Guideposts magazine? Give that some thought. What a wonderful story of not only your mother listening to the desires of your heart at that moment in time but her desire to make something special happen for you. How precious of a memory for you. Thank you for sharing this. Thank you so much for sharing such a sweet memory (and a sweet momma) with us all. What a truly sweet story and wonderful memory! What a precious memory and wonderful tribute to your mom. Sweet Sweet Memory ...... that's what Mama's do!! I seriously need a box of Kleenex now... that is a PRECIOUS memory!! Ok, this one tore at my heart strings terribly. Where are the tissues? This post is precious, dear friend!!! The lengths a Mother goes to, to make those whom she loves happy, is evident in the tenderly wrapped magnolia leaves!!! Thank you for sharing this lovely Christmas memory!!! Such a beautiful story and a precious memory. 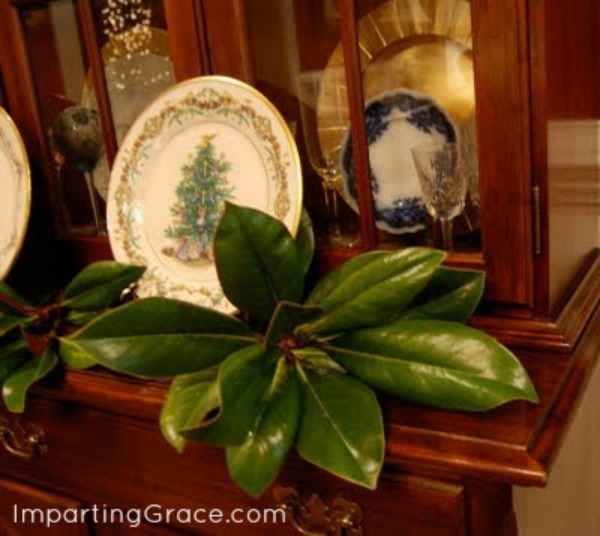 Your magnolia decor is gorgeous, Richella...and those wonderful scenes from Christmases past is a big part of what makes Christmas Christmas! Thank you for sharing.